A crispy, flaky croissant, wrapped around a raspberry and custard filling, in a handy muffin shape… pastry chef and consultant Daniel Fletcher’s cruffin recipe definitely ticks all the boxes for perfect hybrid pâtisserie. As a pastry consultant, Daniel Fletcher spends a lot of his time providing advice on pastry to top chefs across London. He can also be found hosting a pop-up bakery, Sweet., during the summer at the South Place Hotel in Moorgate. where he regularly serves up delicious creations, from indulgent chocolate and salted caramel cookies, to fun peanut butter jammy dodgers, and intricate pistachio and cherry choux bombs. 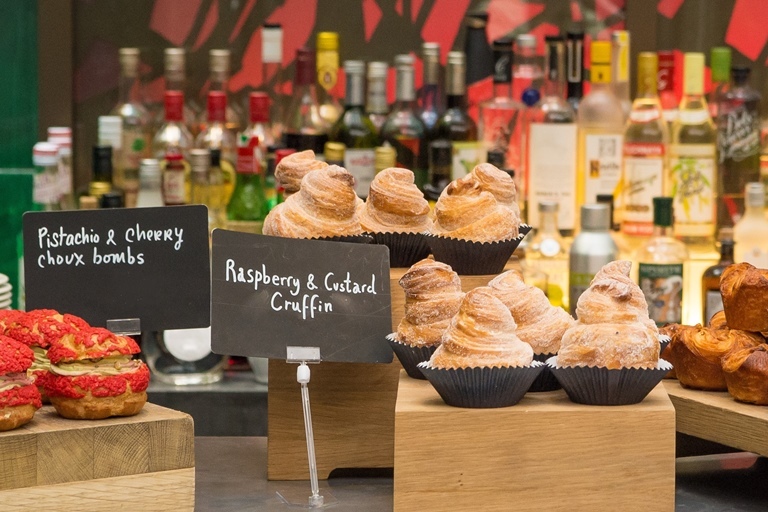 One of the most popular creations on his menu has been his raspberry and custard cruffin, playing to the craze of hybrid pâtisserie that has been sweeping the world; a combination of complex, laminated dough in a familiar muffin shape. It mixes nostalgic flavours (custard and jam) with classic French techniques, yet with a very modern twist. Daniel discusses these trends and techniques in more detail in our article on hybrid pâtisserie, and here provides his professional recipe for making these delicious pastries at home.